Yesterday, we learned the importance of calling Yahweh's Name when we enter into prayer. 1. God has given us His Name to call to Him. 2. The Psalmists call out to God: O Yahweh! It is so important that we call on God's Name when we pray, because we are entering into God's presence in a dialogue. We must turn our 'DIRECTION' to God when we pray. Just like when you have a conversation with someone, you turn your direction to the person you are talking to. Sadly, for many people, when they pray, they have never turned their hearts to God. Why? They are still thinking about themselves, their needs, their little world as they enter into prayer. The result is that they have said a lot of things in their prayers, but it is all a monologue. It is like the Parable of the Publican where the Pharisee is found "praying to himself". The Pharisee is just having a monologue himself. When we do not turn our 'direction' to God, we will never make contact with God. And when there is no contact, no connection with God, our prayers are dull and lifeless, because there is no interaction. This concept of turning to God seems so simple, yet this is so difficult when we implement this in prayer. This is where I have failed for many years in my prayers. Do you find that a lot of time, during the day, your thoughts are constantly about yourself, your families, your work, your meals, your house, your kids, etc. We are usually very 'self' absorbed in our little world. So even when we enter into prayer, our thoughts continue to surround our needs, our feelings, our emotions, our health, etc. When we come to prayer, you must learn to 'turn away' from 'self' and 'TURN TO' God. This is how calling on God's Name "Yahweh" can help us. It helps us turn our full attention to God. "Turn your attention fully to Yahweh". Whenever I call upon God's Name, Yahweh in prayer, it helps me "TURN my focus" to God alone! This is why the Psalmists call on God's Name when they pray. Calling out the Name of 'Yahweh" help them turn their whole attention to God. Tonight, spend some quiet time before God and call upon His Name, Yahweh. 1. Allow yourself to be quiet and 'turn' your attention to God. 2. You may have a lot of things to say to God. Learn to cease all these thoughts. 3. Call on His Name "Yahweh" from your inner most being. See what happens. 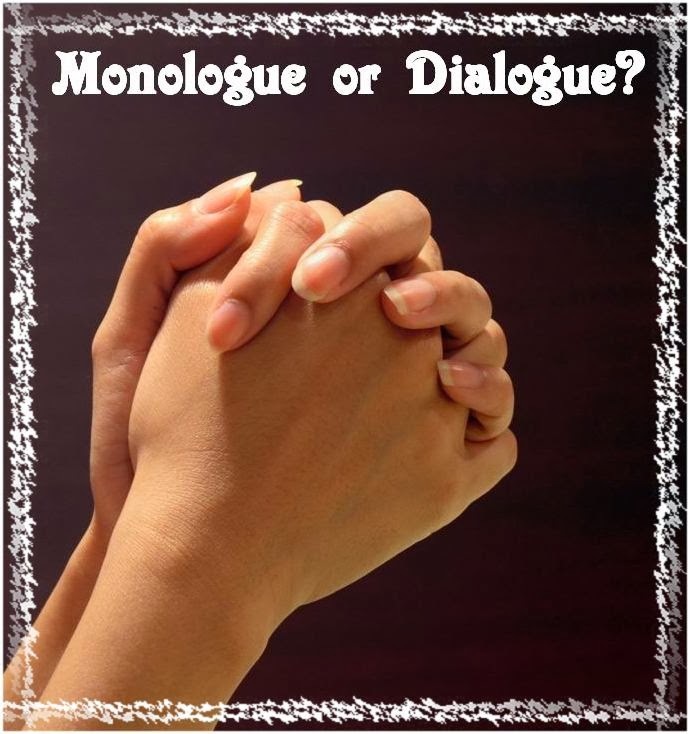 Let your prayer time become a DIALOGUE! I want to hear from you. Share your experiences with me.